Seton’s 1-gallon safety cans are best for small-scale, bench type workstations. These gas cans have carrying handles for easy transport from one area to another. Everything you need to know and comply with for safe handling of flammable liquids is provided below. For more additional information or assistance, please call 1-800-243-6624 and one of our product experts will help you choose the best products for your needs. We carry top manufacturer brands! 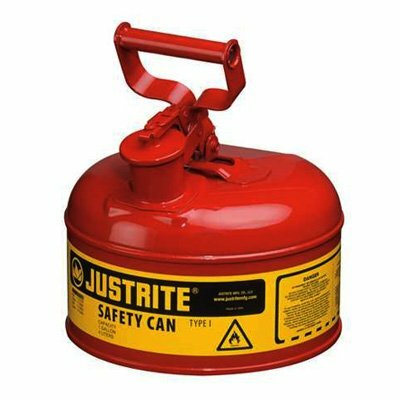 Get the best and most trusted safety cans from Justrite® and Eagle Manufacturing. Here in Seton, we carry a wide selection of Type I and Type II safety cans for every application! Choose between Type I and Type II safety cans from Justrite®. Made from 24-gauge stainless steel with leak-proof self-closing lid for added safety. Even better, Justrite® gas cans come with 10-year quality warranty! Eagle Manufacturing’s line of Type I gas cans are made from 24-gauge galvanized steel. Eagle boasts of seamless construction with double interlock bottom seam and spring-close lid for pressure relief. Both are equipped with flame arrestors to efficiently dissipate heat and prevent combustion. 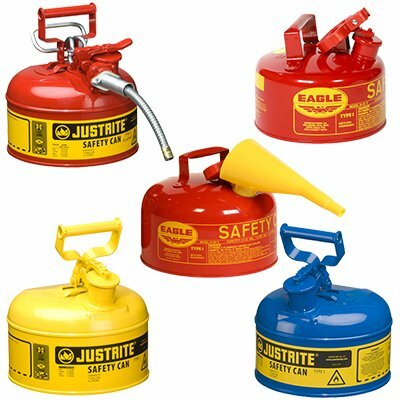 Justrite® and Eagle safety cans are compliant with OSHA and NFPA Code 30 standards for safe storage of flammables. These have also passed rigorous testings and are FM, UL, and ULC approved. Both are also accepted under CARB. Type I vs Type II safety cans, what’s the difference? Type I safety cans have only one opening used for transferring, filling, and dispensing of liquid. These are commonly used to fill containers with large receiving openings such as rinse or cleaning tanks. Type II safety cans, on the other hand, have two separate openings. One is a dedicated opening with lever for filling and a second one with an attached flexible metal hose for more controlled dispensing when pouring into containers with small openings. A more unique Type II AccuFlow™ safety can from Justrite® guarantees a smooth and glug-free flow. It features a patented, easy-to-use Safe-Squeeze® trigger for a more accurate liquid flow. If you’re working on processes that involve the use of various flammable or combustible liquids, making one small mistake could become disastrous. Color-coding tanks or containers serves as an important safety measure. Red is for flammable liquid like gasoline and is the most widely used choice in most industries today. Other colors available for safety cans are Yellow for diesel, Blue for kerosene, and Green for oil combustibles. Always take time to learn to identify and segregate fluid containers within your facility to prevent fire risks and accidents. For a wider range of safety can choices, click here. For immediate assistance, feel free to call us at 1-800-243-6624.